On Labor Day weekend, we bid the summer goodbye. Families picnic; children play hard, knowing the school year is upon them. Politicians pay tribute to workers and to the rewards of hard work. But this Labor Day, workers are struggling to stay afloat. Incomes haven't gone up in the 21st century. Inequality reaches new extremes. A record portion of our national income goes to corporate profits, while a record low goes into workers' wages. Three-fourths of Americans fear their children will fare less well than they have. This Labor Day, we should do more than celebrate workers -- we should understand how vital empowering workers and reviving worker unions is to rebuilding a broad middle class. The raging debate on inequality and its remedies often omits discussion of unions and workers' power. Our extreme inequality is attributed largely to globalization and technology that have transformed our economy. Remedies focus on better education and more training, with liberals supporting fair taxes to help pay the freight. But this leaves power and politics out of the equation. Fact is, Americans are better educated than ever, with high school and college graduation rates at record levels. Technological change was as rapid when America was building the middle class as it is now when it is disappearing. Globalization isn't an act of nature; it is a set of trade, tax and corporate policies that benefit some and injure others. Our extreme inequality and our sinking middle class are the product of political choices and political power. And central to this reality is the rise and the fall of worker power in the form of unions, able to bargain collectively at the workplace and mobilize workers' voice in the political arena. Trying to explain rising inequality without talking about unions is like explaining why a train is late -- the tracks are worn, the weather is bad -- without noting that one of its engines has been sabotaged. The facts are clear (see the report I authored for the Campaign for America's Future for more detail). America's broad middle class was built when unions were strong, representing over one-third of the private workforce. Strong unions helped workers win better wages and benefits at the workplace. Non-union firms had to compete or lose their best workers. Collectively, unions championed vital reforms -- raising the minimum wage, creating Medicare, raising Social Security benefits, workplace safety and more -- that helped build the broad middle class. During those years, workers shared in the increased productivity and profits that they helped to create. Incomes on the bottom actually grew faster than top end incomes. America grew together. Unions didn't die of natural causes; they were assaulted. In the mid-'70s, corporations took off the gloves. They launched propaganda campaigns to paint unions as obstacles to competition. Corporate consultants perfected techniques to torpedo union organizing drives, trampling labor laws in the process. Congress passed laws banning effective union-organizing tactics. Multinationals wrote the trade and tax rules that facilitated moving jobs abroad, and threatening labor at home. With the election of Ronald Reagan, the NLRB was gutted and it was Katie bar the door. The decline of unions is indisputably at the center of America's growing inequality and hallowed-out middle class. And reviving shared prosperity and rebuilding the middle class isn't likely to occur without reviving the ability of workers to organize and bargain collectively. That's true at the workplace. Over one-third of our jobs now are contingent -- part-time, short-term, on-call. Workers cobble together different jobs to survive, but often don't know what their hours will be. But no job is inherently marginal. Workers don't lack education; they lack power. Where unions are strong -- such as for maids, bellman, and porters in New York hotels -- workers negotiate for regular hours, while gaining decent wages, health care and pensions. And its true for our politics. Most remedies for inequality include calls for progressive tax reform, for investment in education and training. More insightful ones include calls for balancing our trade and ending perverse incentives that reward CEOs for plundering their own companies. But none of these reforms is likely without a strong mobilization of workers to elect leaders and drive the debate. 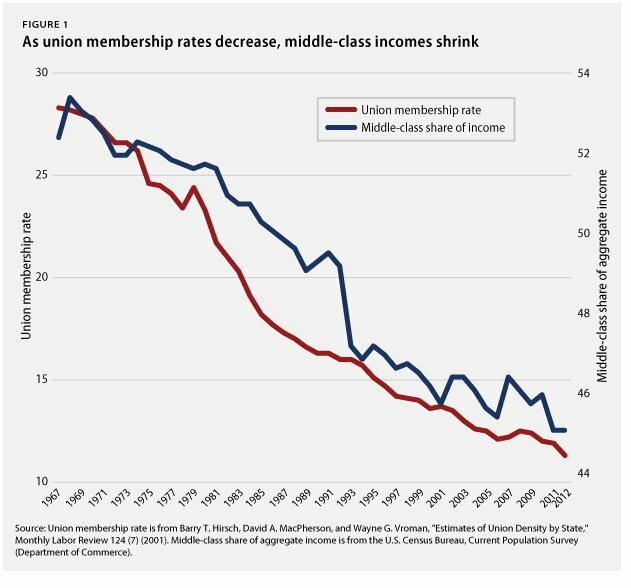 It isn't an accident that corporations and the right have seen weakening unions as central to their political project. Reviving unions will take new forms of organizing, new alliances, new thinking. In Los Angeles, for example, a creative union movement helped elect officials who then used government procurement and zoning powers to demand that companies pay decent wages, adhere to labor standards, and end sabotage of worker organizing. In the fast food walkouts of this summer, new alliances with religious and community groups, support by elected officials such as members of the Congressional Progressive Caucus, provided both protection for the workers and began to enlist consumer support for better wages. In Seattle, unions played a major role in the push for the $15.00 minimum wage. Under Franklin Roosevelt, government policy helped to build strong unions. Under Ronald Reagan and his successors, government policy helped to undermine them. Winning the necessary reforms against the entrenched big money politics of our time won't be easy. But the first step is for progressives to be clear: At the center of any agenda to rebuild the middle class must be a commitment to empowering workers to organize and bargain collectively, to rebuild a strong worker voice both in the workplace and in our politics.